Since it's development in the 1870's, the 12 gauge became one of the most popular firearms in America. Proven by military, law enforcement, and civilian use around the world, the 12 gauge has the power and versatility for hunting, sports shooting, and self defense applications. 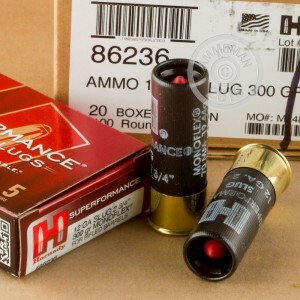 Since 1949, Hornady has been manufacturing premium ammunition tailored to specific shooting applications. 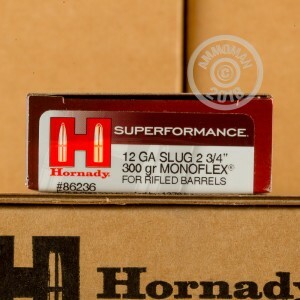 With these Hornady Superformance sabot slugs, you have the knockdown power and penetration needed for deer hunting and self defense applications. Each hull measures 2-3/4" in length and carries a 300 grain monoflex sabot slug that is designed to be fired through a rifled barrel. 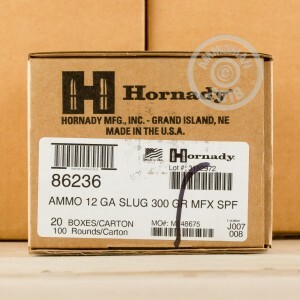 At AmmoMan.com all orders totaling $99 or more will ship for FREE, so stock up and save!